Spring cleaning is a bit more intense for people with pets. Even more so when your pets have extra nasty habits. I have partnered with Pet Supplies Plus of Chicago to bring you pet spring cleaning tips to help get your home and your pets ready for spring. 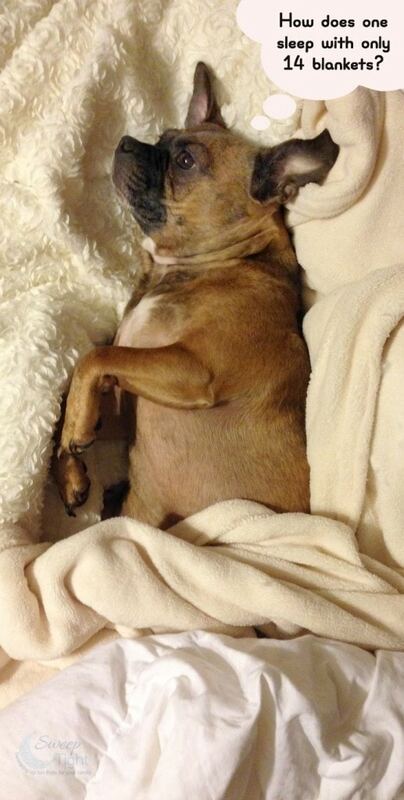 As pet owners, I think we are blinded by love as to how foul our little creatures can be. I mean, really, I try not to think about some of the rotten things they walk in outside, only to come in and jump on our bed. Yes, we try to clean as often as possible, but reminders never hurt. With warmer weather coming, only means more allergens, bugs, and other things that winter was keeping away. It’s time to get even more serious about cleaning. Pet Grooming – One of the pet spring cleaning tips is to clean the pets themselves. Spring cleaning is not just about house cleaning; it’s about cleaning everything and everybody. The first thing to do is get in the habit of brushing your pet regularly. Shedding dogs are about to switch into overdrive. Non-shedders can still benefit from frequent brushings. The Curry Comb by the FURminator is perfect for short and medium coats. 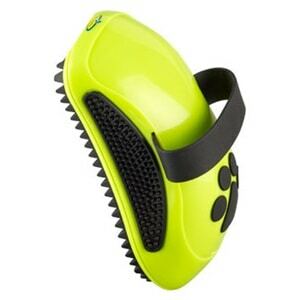 It has molded rubber teeth for combing to stimulate the production of natural oils to promote coat health. The comfortable handle and strap allow for easy handling. This comb is perfect for our two smaller dogs that have short fur. Our German Shepherd requires something a bit more intense. Next, get your pets used to baths a lot more often. 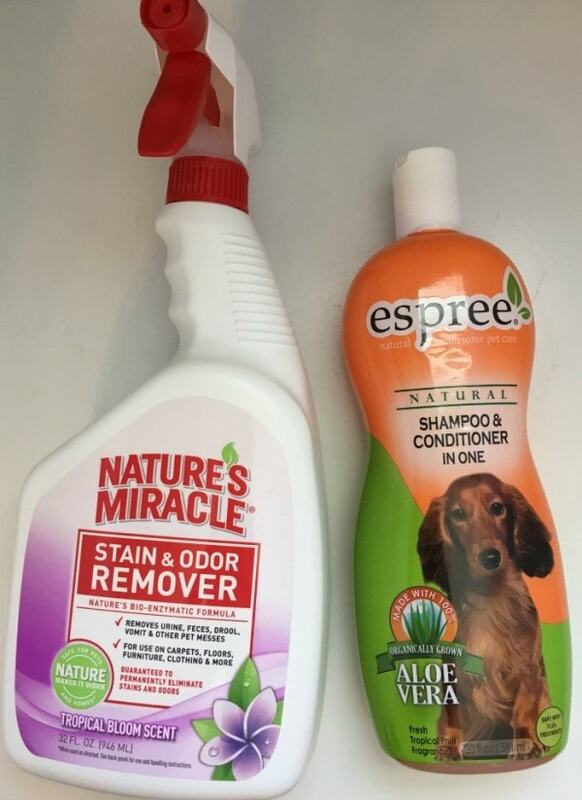 Use espree natural shampoo and conditioner in one. It’s made with 100% organically grown aloe vera which cleans and conditions your pets coat safety. Once again, we know more outside time during warmer weather has our pets picking up all kinds of allergens and gross stuff we’d rather not think about. Make bath time a routine to keep everyone healthier. Outdoor Readiness – Time to add the yard to the cleaning list, and get ready for more outdoor time in general. Hopefully, you’ve been picking up the piles all winter. Otherwise, I do not envy the sloppy mess once the snow melts! Make sure to get yourself a Roscoe Spring-action Pooper Scooper to make this nasty job a little easier. Remember, you can also hire a neighbor kid and pay them (very well) for this task. We have to do this constantly cause our gross dudes like to eat poop. Yep. The vet assured us that they do not lack any nutrients. They are simply just disgusting. Is everyone ready for walks? I know everyone in this house needs to get more active and work off our winter weight. I suggest getting a harness as opposed to just a collar for dog walks. As much as you trust your dog, you can never anticipate how they may react to another animal while you are walking. It’s best to stay on the safe side and have as much control as possible. The Coastal Pet Products adjustable harness will give you so much more peace of mind. Trust me, our Franklin only had to Houdini himself out of his collar once for me to realize he requires a harness. Indoor Cleaning – Pet spring cleaning is different from normal spring cleaning indoors, as well. You want to use effective products that are safe for your pets. Especially on surfaces that you notice your pet licking. Like, our little weirdo, Franklin, likes to lick the couch a lot (?). I make sure to use a product that is safe for him to be himself. Nature’s Miracle Stain & Odor Remover contains a bio-enzymatic formula the removes the nastiest of pet messes while remaining safe to pets. Take this time to also wash or replace dog beds. Dog beds don’t have to be eyesores, either. You can find one to match your decor or add a pop of color to the room. These pet spring cleaning tips might seem obvious, but guess what? We sure weren’t ready. After the last thaw, we realized we had a broken pooper scooper. Not cool. It’s better to be ready with all the products you need when you need them. Check for a Pets Supplies Plus near you to stock up on supplies. Do you have any pet spring cleaning or safety tips? I just gave my pups their baths the other day. They like to roll in gross stuff all the time too. They all might be nasty furry creatures but they sure are downright adorable, so I think that mostly makes up for it 😉 I remember when my dog was still alive; he would get into the worst things and SMELL! Being prepared is definitely a must! Makes me glad I don’t have a dog right now. I use a curry comb on my miniature horse (Great Dane) He loves being brushed with it.I can’t wait for warmer weather so we can play with the hose! Oooh, I love that shampoo & conditioner in one. That would make washing my dog go so much easier and smoother. Thanks so much for sharing… Perfect timing since we seem to have more muddy days than dry ones here! Proper grooming is so important year round but especially in the sprin. Our dogs can shed SO much with the season change. These are great tips!! I know our dog loved when spring came around so they could go outside more often but that meant more cleaning. It’s a good thing to remember about cleaning up after the furry members of the family too. I love Nature’s Miracle. We have used it before and it works really well. My dog is in desperate need of a bath today. Not sure what she got herself into! LOL. Nature’s Miracle will let her keep her indoor status. I’ve used the Nature’s Miracle before and it works so great. Couldn’t imagine not keeping it on hand. I love the smell of Aloe Vera, your dog is adorable I wanna give him a hug. No spring tips for my dogs but I do need to brush him daily, I know this as he sheds everywhere right now! These are some great tips.My cat is shedding like crazy right now because of the warmer weather.